If you take good care of your Tacori jewelry, it can be passed from generation to generation. Due to the individual character of hand craftsmanship, you may notice slight variances in each Tacori design, which ensures that no two pieces are identical. This personal touch transforms each Tacori piece into a small work of art. It is recommended that you treat your Tacori heirloom with the same care it was given in its creation by the Tacori jewelry artisans. When not being worn, store your Tacori jewelry separately so it will not be scratched or damaged by other jewelry. Protect all jewelry from sharp blows or strong pressure. Cosmetics, hair spray, perfumes, lotions, other substances and chemicals may cause build-up of grime, will diminish jewelry’s natural sheen and beauty. It is recommended that you remove your jewelry while applying or using chemicals. To restore a beautiful shine to your Tacori jewelry, authorized Tacori retail J.R. Dunn Jewelers can recommend a cleansing gel and brush that is suited to your piece. It is NOT recommended to using a home ultrasonic machine, which could loosen stones if used incorrectly. 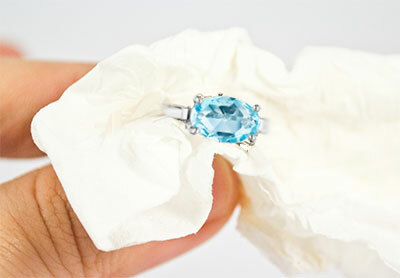 Polish your Tacori piece with a clean, soft, slightly damp cloth before and after wear and handling. This will help prevent a build-up of natural oil accumulation that occurs through normal wear when the jewelry item touches skin. Always remove jewelry and store it carefully in a safe place when working with your hands, such as: performing household tasks, gardening, playing sports, bathing, using abrasive products or engaging in any activity that could damage or cause the loss of your jewelry. If your piece has gemstone components, be sure to never submerge your piece in an ultrasonic or steam cleaner, nor expose them to saltwater or harsh chemicals (including household cleaning supplies). Avoid extended exposure to extreme temperature or strong sunlight, which may cause gem discoloration. When not wearing your Tacori piece, we encourage you to store your Tacori design in the soft pouch or box provided when you purchased your piece. If received, the Tacori pouch is a specially designed pouch with ultra-soft finish that will not scratch your piece, and it also has anti-tarnish properties that will help the design maintain its bright finish longer. The Tacori pouch has the added value of protecting the piece from any hard impact or being scratched by other items. If received, the Tacori box is a wonderful place to store your jewelry when not being worn to keep it secure and protect it from any impact or from being scratched by other items. For continuing care and questions, we recommend that you visit or contact J.R. Dunn Jewelers, an authorized Tacori retailer for a cleaning, check-up, and for suggestions to any maintenance questions you may have. Your comments and questions are very important to us and we enjoy answering each one personally. If you have questions about a Tacori piece that you own, simply give us a call and we would be glad to assist you.